I'm having to dig really deep this week. Which is exactly the reason why it's so good to stop and really focus on what there is to love in this life. It's been a ......(insert any number of horrible words here) week with my workload being incredibly overwhelming with no end in sight for the foreseeable future. One day I might elaborate in much more detail, but for now I'll just say that up until 4-6 weeks ago, I was in a pretty good space feeling that my workload was about right. But due to staff changes in my team (my boss left in mid-June and my direct report is also leaving Friday), our financial year-end and audit on right now, and an integration of another company into our financial system also happening right now, I feel as if I'm barely treading water. But it's not all doom and gloom as I have managed to recruit Jackie (that's she of famous friend and nearly sisterhood status who doesn't mind me picking her up from town in my pyjamas like I did on Wednesday night!) to come and work for me to replace my staff member who is leaving. We used to work together at another company a few years back, and so I know how bright and capable she is, so right now I'm totally hanging out for her to come on board at the end of August. On top of the work stresses, I've been battling the pretty uncomfortable physical pain of an incredibly stiff upper back and neck (I've had to roll out of bed as I couldn't sit up from lying it had gotten so bad) and tight leg muscles to the point I could barely bend my legs and it's all been adding up to NOT MUCH FUN. In the past week I've had an osteo and physio session including acupuncture and a prescription for some magnesium. The physio reckoned the tight muscles could well have been brought on by all the work stress, but my legs still feel like I have climbed to the top of Mt Taranaki and back again in one day. And I do know what that feels like since we did it in 2005! So enough of the things I am not loving and moaning about, and onto what I truly am loving. We don't often get to see my brothers, with one in Sydney and the other busy running his 3 bike shops in Hamilton, Cambridge & Te Awamutu. So it was a nice surprise to get a call from Sam saying he was going to a conference in Sydney and is flying via Wellington so is coming to spend the day with us on Sunday. It'll be so great to hang out even if it is just for the day....yippee! So one of the things I have really been looking forward for ages to is cutting my work hours back (only from 40 to 35). By juggling my work hours around a bit, it means I can leave at 2.30pm every day to do the school pick-up, which I've been wanting to do since before I went back to work full-time last year. However, in light of the current work situation, the timing of cutting my hours isn't great, and I'm not entirely sure how this is actually going to pan out over the next couple of months, but even the thought itself is pleasing, knowing that I might be able to have a couple more hours with my boys each day! It's Noah's Happy Last Day (he picked the Pyjama Day theme) today, and so ends a very big chapter in his and our lives so far. I think I could turn into a blubbering mess come pick-up time tonight. The great thing is that at hopefully 1-2 days a week he'll be able to pop in to say hi to the teachers when we pick Mylo up in the afternoon, so it's not goodbye forever. Yesterday we baked Mark's famous Chocolate Brownie for the teachers, as well as a cake and some goodies for the kiddies. On Monday, Mark and I are both taking the day off to spend with Noah. So far on the agenda for the day is buying his school stationery (oops yes I know we are a bit behind the 8-ball given he starts on Tuesday! ), going to see Kung Fu Panda 2 at the movies, having lunch together and just generally giving him a special day to remember with his mummy and daddy. Nikki (of Life's Wonderful Happenings) and I have gotten into a pretty regular habit of skyping most weekends between London and Wellington, sometimes nattering away for up to an hour about everything and nothing. I love and look forward to this part of my week. If you haven't already, go and check out her blog - she is truly a breath of fresh air! Love ya babe! So I feel like I have done a lot to prepare for this Star Wars party but as always there seems to b e still more, more and more to do. Loving the easy-peasy cheaper-than-bought party plates I mocked up on Wednesday night. One week and counting! Hope that everyone else's weeks have been full of loving. I for one am absolutely HANGING out for this weekend! 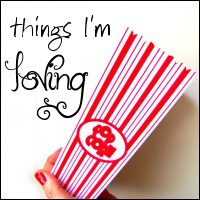 Be sure to check out all the good things that others are loving over at PJ's place! Yes you do sound stressed! I love that idea of you guys taking to day off and spending it with Big boy before school. Great idea! Wishing you a stress free weekend! And guess what looks like we will be meeting on the 20th of August! PJ and I are headed to the big bloggy get together! Ohh yay for the mention! I love skyping you too :) Look forward to it so much! If it's any consolation, I wake up with aching hips and lower back so I know how you feel hun! I would've been a blubbering mess at Noah's happy last day! Can't believe he's 5 tomorrow! I miss my Noah! P.s - Love the star wars plates! can't wait for more photos from the party! I have read this post about 5 times and keep thinking I have commented but clearly haven't. *sigh* must be the end of the week! It's super hard to work with small ones especially under pressure- my heart goes out to you! And (for the 100th time) can't WAIT to meet you IRL!!!! Oh no - sounds like a huge pile of stress at your place right about now :-( Hopefully things will work themselves out - I can't imagine how hard it is to juggle such stressful work and the kiddies all at once! Hopefully the pain side of things gets sorted at least - awful! Happy 5th birthday to Noah - can't wait to see some pics from this amazing party~!! !